OPPO is not showing any new smartphone models at the Mobile World Congress but, as teased last week, the Chinese company has announced 5x Dual Camera Zoom system for smartphones. The system uses a periscope-style design and fits into a module that is only 5.7mm tall. Light is diverted through a prism and into the dual-camera's telephoto lens which is arranged at a 90-degree angle to the accompanying wide-angle. By shifting the path of the entering light Oppo is able to achieve a 3x optical zoom which is combined with a proprietary image fusion technology for digital zoom. The end results is a total 5x lossless zoom factor. At longer focal lengths camera shake becomes more of a limiting factor which is why OPPO has also integrated optical image stabilization into the system. Both the prism and tele lens can sense vibrations and compensate for them in real time. The mechanism dynamically adjusts its angle at increments of 0.0025 degree and OPPO promises 40 percent better performance than previous OIS generations for stable shots even at the 5x zoom setting. OPPO has not provided any information on sensor sizes and apertures, which would be critical to the image quality of the system, but nonetheless the technology looks like a very innovative approach to zooming on smartphones and we are looking forward to seeing it implemented in a device. I had the Casio EX-V7 and EX-V8 and they did the same thing, but across the top of the camera. 8x optical. It was really cool to get that much zoom in a pocket size camera without an extending lens. I dont imagine why it was never adopted in smartphones so far, as Minolta did it back in 2002! Yes, it was an amazing camera at its time. We bought it for our daughter but unfortunately it got stolen later. This technology will find its way to smartphones one day. I wish next OPPO will add LG's UWA 12mm lens, or next LG will add a OPPO's tele lens to make a three lens phone: 12mm, 24mm, 48mm, plus digital zoom as needed. Now, from what I can see that this OPPO has NO zoom, but two fixed FL lenses. Misleading to use the same zoom term, without (dis)qualifiers. This kind of „computational” zoom works wonders, but to call it „zoom” would be just the same as saying „zoom” for the Lumia/Zeiss 41Mp wonder; it's not camera that does the zooming. But, horror: even DPReview uses the completely misleading „5x OPTICAL zoom” thingie, without calling them on their lie: it's a 3x zoom that has an extra step/sensor. It's another new technology that does not happen to have a proper name yet... But it's certainly far from what Lumia's doing. If I got it right, it combines images from wide and tele lenses using some [supposedly] clever digital magic. The word "optical" is (quite understandably) used here to stress the fact that it has tele lens at work, that it's not just digital zoom we're accustomed to (and rightfully hate). Software interpolation between two distinct lens+sensor combination. No possible stretch of the imagination would result in calling this method „optical zoom”. Likewise, no stretch of imagination should result in calling DPR's statement "just the same as saying 'zoom' for the Lumia/Zeiss 41Mp wonder". See my point? No imagination needed. Since the very beginning of this site, Mr. Askey set the record straight and named the software trickery for what it is, anything else but zoom. I bought Kodak V705 10 years ago, and V705 is more less as same as this OPPO. Yes, the 2006 V570 and 2007 V705 are a dual periscope lens 23 mm fixed, 39-117 zoom, total 5x zoom camera. f2.8 - f4.4. But with its 20mm compact camera design it is 3x as thick as a smart phone and uses larger lens apertures. Kodak has no OIS. This OPPO has OIS on zoom, but not on fixed lens/sensor. I wish it has OIS on both + the fixed lens is UWA. BTW, my V705's quality is the worst comparing to all P&S that I own. I replaced lens assembly once, but it went bad again. Out of business was the only way out for Kodak as far as I can see. While not periscope (either? ), Samsung WB210 is another sample; optional 20mm setting (zoom optics visibly & audibly change) versus the regular 24-240mm optical zoom (but no fusion, and sadly the 20mm setting blocks nearly every other setting, like video). IQ is impressive too, for that era (2011). The above Kodak's were possibly even more unique for having the first onboard stitched panorama? Yes, Kodak's has "onboard stitched panorama", and it works, but my Olympus TG-2's ""onboard stitched panorama" can not stitch correctly. and it worked. Don't know why they waited so much. I care less about this and more about stuffing a 1" sensor with fast lens in there. That would be the sh!t! Yes, I know Panasonic already tried it, but that was really half assed. You start to wonder if just 3 prime lens modules would be simpler and cheaper. 25-50-100 sounds good to me and gives "4x zoom"
Or honestly, since we have panorama for wide angles, I'd probably take a double lens 35/85 if I was dreaming. Too much vertical depth at longer focal lengths. Nobody wants a tube sticking out from the back of their phone. The only way to do this is to go sideways. Just give me the two discrete optical focal lengths, never mind about synthesised extrapolation/interpolation. It'd be almost like having my Olympus AF-1 Twin again (35 mm and 70 mm focal lengths with 35 mm film). I did well with that camera on my backpacking travels, when I didn't want to lug my Nikon FE and lenses around with me. Even now, with a zoom lens on my camera, I find myself taking a considerable percentage of my pics at the two extremes of focal length. So this 3x (or 5x magic) zoom - what equivalent is the tele lens? Need 600mm at least LOL. "OPPO announces dual-cam 5x optical zoom technology for smartphones"
Really? I thought the optical zoom was 3x. Who is responsible for the marketing inflation here, Oppo or DPR? These systems get an additional boost in resolution from super-resolution techniques (combining images from each camera). This is a real over-sampling technology that allows a 5x equivalent optical zoom performance from a 3x focal length ratio. This is not marketing BS. Of course it is marketing BS, because whatever else it might be, it is NOT 5x OPTICAL zoom. They have misappropriated the term optical for its marketing strength. If they are so proud of their tech, call it what it is (follow your link, whatever) and let it earn its own reputation, but don't pretend it is something which it is not. The end result might be equivalent to a 5x optical zoom, or even indistinguishable from it, but it isn't achieved by using a 5x zoom lens, which means that it isn't really 5x optical zoom. They use a combination of optics to achieve the zoom. It definitely isn't digital zoom or cropping. No, it's not the same as digital zoom, I think we're all aware of that, but it isn't purely optical zoom either. This isn't achieved solely by physical means, like when using a regular zoom lens; it involves image processing, i.e. it's a form of computational photography. That's not what we usually mean when talking about 'optical zoom'. Great! If this is happening maybe they can make 16 of these lenses to make 1 dslr picture.... God Damnit Light L16 come out with it already! The additional resolution is from super resolution techniques. ...correct, so it is like the OP said. 5.7 mm is pretty thick for a phone module, though, right? No that much really. Camera modules usually are around 4-5mm thick. Can someone correct the headline, or is OPPO actually calling this "5x optical" zoom? That's certainly not what's described here. I think it's basically a 24mm prime paired with a 40-120 zoom (or something like that) and it interpolates. so at least on a DPR headline, call it what it is - 5x interpolated zoom. Why stick the word "optical" in there where it is clearly not justified? Super resolution allows the system to deliver equivalent performance of a 5x optical zoom from a 3x focal length ratio. It's hard to market without it sounding like BS, but it's real. The best way not to sound like marketing BS is not to spout it. Why just don't make the light entrance to the side of the phone? great for covert ("candid", ahem...) shots on the beach. Actually it's very strange that almost anybody waited so long to use such a well known technology. (I had a small Minolta compact more than 10 years ago) Maybe a patenting issue? I thought the exact same thing...hmm, don't I recall a Sony t1 from 10 years ago doing the same? I wondered why they didn't do it in a cell phone sooner. plenty of width these days with the huge phablet phones people are using. 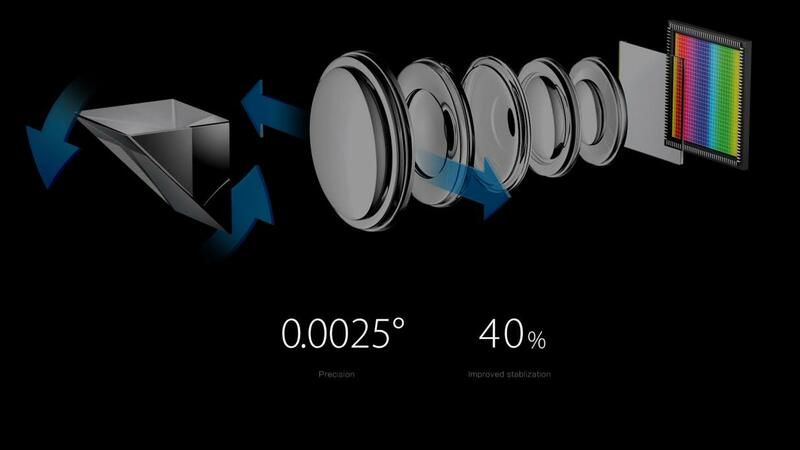 This concept has already been implemented on the Asus Zenfone Zoom. It has a 3x optical zoom with periscope optics. Well this is 5x, so they can still claim "first" for that. Surprising the Zenfone wasn't really widely available. I wanted to check it out, but it took so long to get to the U.S. that it was irrelevant. The 5x is digital interpolation or something. "Oppo is able to achieve a 3x optical zoom which is combined with a proprietary image fusion technology for digital zoom. The end results is a total 5x lossless zoom factor." My guess? This is probably the exact same camera module sold by Hoya that Asus used. Or at least identical optics, perhaps with a slightly updated sensor. 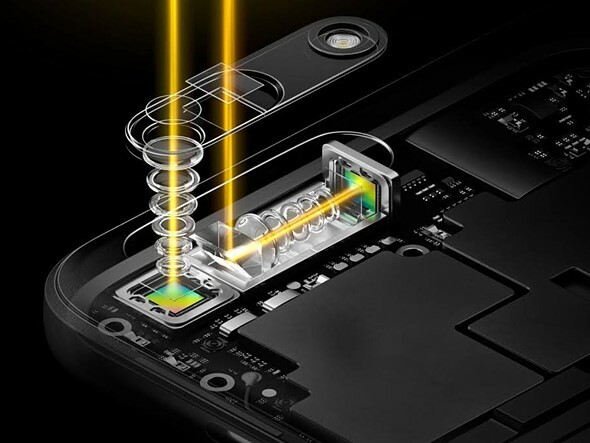 No, the Asus Zenfone Zoom has a camera bump and a very slow zoom lens. The Oppo version consists of 2 prime lenses that are surely faster. Yea, but Asus sold like 2 phones, so who cares. Oh, so this isn't even a 3x optical zoom at all? It's just another case of BS marketing where it's a telephoto lens 3x longer than the standard lens and calling it a zoom? Ugh. That's the trouble here. The term "optical" zoom has been so bastardised, even by DPR, that once instantly has one's guard up. Once words don't mean what they used to mean, we are on shifting sands with all these marketing headlines. Sure, we all want the holy grail, but they need to stop announcing it until they get there. I don't think it's two primes. It appears to be a prime and a zoom, which will be larger and more expensive than two primes, but get much better results and intermediate lengths. There's definitely a 3x optical zoom lens, combined with a wide angle prime lens. So there is a little missing overlap there where it uses interpolation, but for most of the zoom range it is optical. If the zoom range was 25-125mm equivalent, for 5x. The wide angle could be 25mm and then the optical 3x zoom from 42-125mm. So the only digital zoom is from 25-41. Even using periscope optics, to get to >100mm equivalent it will still need a 14mm real focal length even using a tiny, tiny iPhone-sized 1/3" sensor. That means if it has a reasonably fast aperture of f2.8 (pretty terrible for a 1/3" sensor) it will have a Z-height requirement of 5mm for the physical aperture. That will definitely lead to a camera bump. So likely it will have a very, very small sensor or a very, very small aperture (f4?). Possibly both. Doesn't bode well for performance if they're focused on absolutely minimizing thickness of the device, which seems to be the argument here. Google: "folded telephoto camera lens system"
OPPO must have seen them, too. A mirror inside a smartphone camera? Oh the horror. What will the mirrorless brigade say? It's a promising concept - I like it. Previously, the only way to achieve decent optical zoom on a smartphone was to have a conventional telescoping lens directly over the sensor; both the Samsung Galaxy S4 Zoom (phone built-in), and Moto True Zoom (external phone mod) are good examples. This tech will have some development issues to work out, no doubt there, but it looks like a solution that won't compromise the aesthetic appeal of the sleek modern smartphones. I was going to say, "didn't someone else try this?" The DiMAGE X wasn't exactly a great compact, either...even by 2002 standards. They were used in a lot of cameras over the years. Fuji Z series and Sony T series as some more recent examples. It was nice that the lens didn't extend and they had a sliding lens cover that also acted as a power switch. Also, most waterproof compact use these optics because it's really tough to make an extending zoom water tight. If the already tiltable (OIS) prism is 45 degree, they could use the same periscope technique and sensor for a front camera by tilting it a full 90 degree. Of course this would limit the size of the diagonal, due to height issues. But they could go for a block of two prisms (pointing up and down) that could be shifted perpendicular to the light-direction. Yeah I'd rather see a phone with an UW (like LG's), a typical (for phones) 28mm, and a ~50mm (like Apple's). The distinction between UW, wide, and normal is lost on most non photogs and selling them on a "3x zoom" camera with 3 modules wouldn't necessarily be easy. What I'd really like to see is a modular phone like the Moto Z that introduces a module with a prime at whatever FL and a 1" sensor. If it fits into the CM1 then it can fit into a Mod, only difference is you could split them for better portability and in hand feel when only using the phone. Priced right (~$350 for the mod max) it'd have some decent appeal IMO, at least more so than the ill fated Sony QXs and their zooms. Ultrawide lenses are barely relevant when all phones do such great panoramas. Turn the camera vertical, do a short sweep and you have a wider effective shot than a 21mm lens anyway. Oops, dunno how that got double posted... A panorama doesn't give the same perspective as an UW, it might suffice (or even be preferable sometimes) for the kinda snaps people take with phones but it's still not the same, and won't work with any kinda motion in scene. Super resolution genuinely provides additional resolution (by fusing the two camera images). The 5x claim is sound. We had a sony pocket camera once with a folded periscope style optics. I was wondering when this idea would make a splash in cameraphones? 3x, not 5x. Until we see otherwise, the "5x optical" zoom is just marketing.